Two months after a restored flatiron building in the downtown was fully leased months before the space was ready for occupancy, another nearby historic property is for sale. The four-story brick landmark at 614 Washington St., also a flatiron style commercial building, has been listed for $1.1 million. Purchased in 2003 for $200,000 by the Ann Nell and Michael T. Phelan Trusts, the 129-year-old former shoe plant is assessed at $507,500. In 2012, the owners borrowed $144,000 from the Economic Development & Industrial Corp., the city’s development bank, for improvements to the 9,500-square-foot building, according to county records. 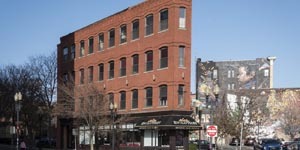 This historic four-story brick building in the downtown has been listed for sale at $1.1 million. The listing agent, Joan Regan at Century 21 Hughes, said the property has tenants on the first and fourth floors, while the second floor is vacant and the third floor needs work. A recent addition to the property included an elevator and central air conditioning. There’s a 10-car parking lot next door and the vacant space could be a great place for two condominiums, she said. At Central Avenue and Willow Street, the MG2 Group in Quincy recently transformed a former bank building into 47 luxury apartments that feature steel appliances, in-unit washer and dryer, and individual HVAC controls. Dubbed “The Vault,” the $12 million facelift has paid off. The first tenants, who moved in Labor Day weekend paying rents from $1,300 to $2,200 for studios, and one- and two-bedrooms, have access to a fitness center and soon a coffee shop and a pizza bar will open on the ground floor. The recent Beyond Walls mural festival brought thousands of residents and visitors to the downtown to view more than a dozen exterior walls painted by 20 artists from all over the world. Drew Russo, executive director of the Lynn Museum, said the sale represents a great opportunity for a new buyer. “We’re hopeful that the new owners of 614 Washington St. will demonstrate a similarly strong commitment to the ongoing efforts to revitalize the downtown,” he said.